This request operation sent to net.pipe://localhost/Acctivate/16580/Service32Bit did not receive a reply within the configured timeout (00:01:00). The time allotted to this operation may have been a portion of a longer timeout. This may be because the service is still processing the operation or because the service was unable to send a reply message. Please consider increasing the operation timeout (by casting the channel/proxy to IContextChannel and setting the OperationTimeout property) and ensure that the service is able to connect to the client. First, browse to the mobile webservice page and review and/or reselect the printer within the printer assignments page. Select the “Set printer assignments for reports” link on this webservice page. When prompted to log in, enter in an Acctivate user ID and password. 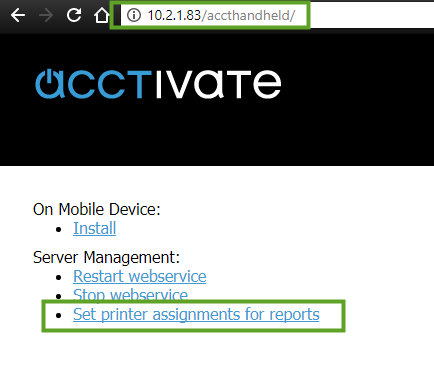 On the Printer Assignments page, select a shared printer for each report you may print within Acctivate Mobile.